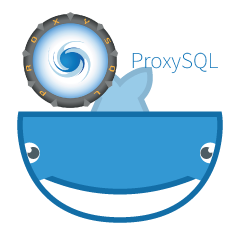 ProxySQL is an intelligent and high-performance SQL proxy which supports MySQL, MariaDB and ClickHouse. Recently, ProxySQL 2.0 has become GA and it comes with new exciting features such as GTID consistent reads, frontend SSL, Galera and MySQL Group Replication native support. It is relatively easy to run ProxySQL as Docker container. We have previously written about how to run ProxySQL on Kubernetes as a helper container or as a Kubernetes service, which is based on ProxySQL 1.x. In this blog post, we are going to use the new version ProxySQL 2.x which uses a different approach for Galera Cluster configuration. We have released a new ProxySQL 2.0 Docker image container and it's available in Docker Hub. The README provides a number of configuration examples particularly for Galera and MySQL Replication, pre and post v2.x. The configuration lines can be defined in a text file and mapped into the container's path at /etc/proxysql.cnf to be loaded into ProxySQL service. The image "latest" tag still points to 1.x until ProxySQL 2.0 officially becomes GA (we haven't seen any official release blog/article from ProxySQL team yet). Which means, whenever you install ProxySQL image using latest tag from Severalnines, you will still get version 1.x with it. 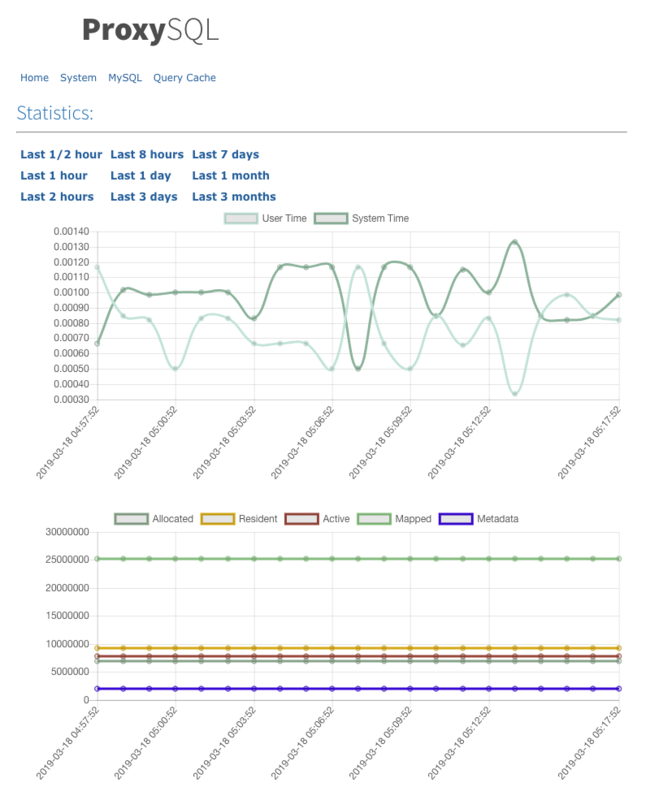 Take note the new example configurations also enable ProxySQL web stats (introduced in 1.4.4 but still in beta) - a simple dashboard that summarizes the overall configuration and status of ProxySQL itself. writer_hostgroup: ID of the hostgroup that will contain all the members that are writers (read_only=0). backup_writer_hostgroup: If the cluster is running in multi-writer mode (i.e. 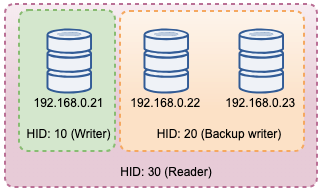 there are multiple nodes with read_only=0) and max_writers is set to a smaller number than the total number of nodes, the additional nodes are moved to this backup writer hostgroup. offline_hostgroup: When ProxySQL monitoring determines a host to be OFFLINE, the host will be moved to the offline_hostgroup. max_writers: Controls the maximum number of allowable nodes in the writer hostgroup, as mentioned previously, additional nodes will be moved to the backup_writer_hostgroup. writer_is_also_reader: When 1, a node in the writer_hostgroup will also be placed in the reader_hostgroup so that it will be used for reads. When set to 2, the nodes from backup_writer_hostgroup will be placed in the reader_hostgroup, instead of the node(s) in the writer_hostgroup. max_transactions_behind: determines the maximum number of writesets a node in the cluster can have queued before the node is SHUNNED to prevent stale reads (this is determined by querying the wsrep_local_recv_queue Galera variable). read_only - If ON, then ProxySQL will group the defined host into reader_hostgroup unless writer_is_also_reader is 1.
wsrep_desync - If ON, ProxySQL will mark the node as unavailable, moving it to offline_hostgroup. wsrep_reject_queries - If this variable is ON, ProxySQL will mark the node as unavailable, moving it to the offline_hostgroup (useful in certain maintenance situations). wsrep_sst_donor_rejects_queries - If this variable is ON, ProxySQL will mark the node as unavailable while the Galera node is serving as an SST donor, moving it to the offline_hostgroup. wsrep_local_state - If this status returns other than 4 (4 means Synced), ProxySQL will mark the node as unavailable and move it into offline_hostgroup. wsrep_local_recv_queue - If this status is higher than max_transactions_behind, the node will be shunned. wsrep_cluster_status - If this status returns other than Primary, ProxySQL will mark the node as unavailable and move it into offline_hostgroup. Having said that, by combining these new parameters in mysql_galera_hostgroups together with mysql_query_rules, ProxySQL 2.x has the flexibility to fit into much more Galera use cases. For example, one can have a single-writer, multi-writer and multi-reader hostgroups defined as the destination hostgroup of a query rule, with the ability to limit the number of writers and finer control on the stale reads behaviour. Contrast this to ProxySQL 1.x, where the user had to explicitly define a scheduler to call an external script to perform the backend health checks and update the database servers state. This requires some customization to the script (user has to update the ProxySQL admin user/password/port) plus it depended on an additional tool (MySQL client) to connect to ProxySQL admin interface. Besides, since ProxySQL scheduler thread executes any script independently, there are many versions of health check scripts available out there. All ProxySQL instances deployed by ClusterControl uses the default script provided by the ProxySQL installer package. Groups the hosts into 2 hostgroups (writer and backup_writer). Writer is part of the backup_writer. 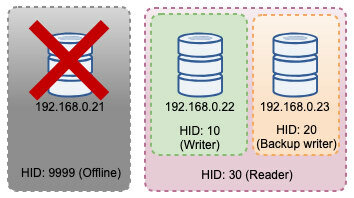 Since the writer is not a reader, nothing in hostgroup 30 (reader) because none of the hosts are set with read_only=1. It is not a common practice in Galera to enable the read-only flag. Groups the hosts into 3 hostgroups (writer, backup_writer and reader). Writer is not part of backup_writer. Similar with writer_is_also_reader=1 however, writer is part of backup_writer. With this configuration, one can have various choices for hostgroup destination to cater for specific workloads. "Hotspot" writes can be configured to go to only one server to reduce multi-master conflicts, non-conflicting writes can be distributed equally on the other masters, most reads can be distributed evenly on all MySQL servers or non-writers, critical reads can be forwarded to the most up-to-date servers and analytical reads can be forwarded to a slave replica. Hostgroup 10 will be the writer_hostgroup, hostgroup 20 for backup_writer and hostgroup 30 for reader. We set max_writers to 1 so we can have a single-writer hostgroup for hostgroup 10 where all writes should be sent to. Then, we define writer_is_also_reader to 1 which will make all Galera nodes as reader as well, suitable for queries that can be equally distributed to all nodes. Hostgroup 9999 is reserved for offline_hostgroup if ProxySQL detects unoperational Galera nodes. We set transaction_persistent to 0 so all connections coming from these users will respect the query rules for reads and writes routing. Otherwise, the connections would end up hitting one hostgroup which defeats the purpose of load balancing. Do not forget to create those users first on all MySQL servers. For ClusterControl user, you may use Manage -> Schemas and Users feature to create those users. Keep in mind that running with persistent storage like the above will make our /root/proxysql/proxysql.cnf obsolete on the second restart. This is due to ProxySQL multi-layer configuration whereby if /var/lib/proxysql/proxysql.db exists, ProxySQL will skip loading options from configuration file and load whatever is in the SQLite database instead (unless you start proxysql service with --initial flag). Having said that, the next ProxySQL configuration management has to be performed via ProxySQL admin console on port 6032, instead of using configuration file. The output above shows that hostgroup 30 does not process anything because our query rules do not have this hostgroup configured as destination hostgroup. The resultset returns the related MySQL variable/status state for every Galera node for a particular timestamp. In this configuration, we configured the Galera health check to run every 2 seconds (monitor_galera_healthcheck_interval=2000). Hence, the maximum failover time would be around 2 seconds if a topology change happens to the cluster.